Jangarh was a 'Gond' tribal (a tribal community located in central India). He has been recognised as one of the most talented Indian artists of contemporary tribal art, that orginated from a rural, non urban background. In 1986 he received the 'Shikhar Samman' one of the highest artistic awards from the Indian government in recognition of his artistic contribution. This composition was produced by the artist in the latter stage of his career, possibly for an Indian gallery or for an exhibition at one of the folk art and craft museums in India, either the Arts and Crafts Museum in New Delhi, or the Bharat Bhavan Tribal Museum in Bhopal. Jangarh died in July 2001. 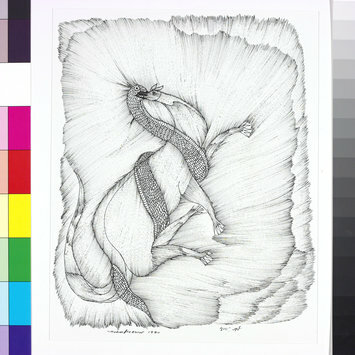 The artist has used a black pen to depict a mongoose entwined with a snake, shown against a background of black feathery lines. The overall effect is that of dynamic movement, enhanced by the spiralling figure of the snake and the outward concentric lines. In this case he has not used traditional materials but used a cheap pen to depict a very elaborate design. Drawing in black pen on white paper of a mongoose entwined with a snake, shown against a background of black feathery lines. Signed and dated in Hindi on lower right. 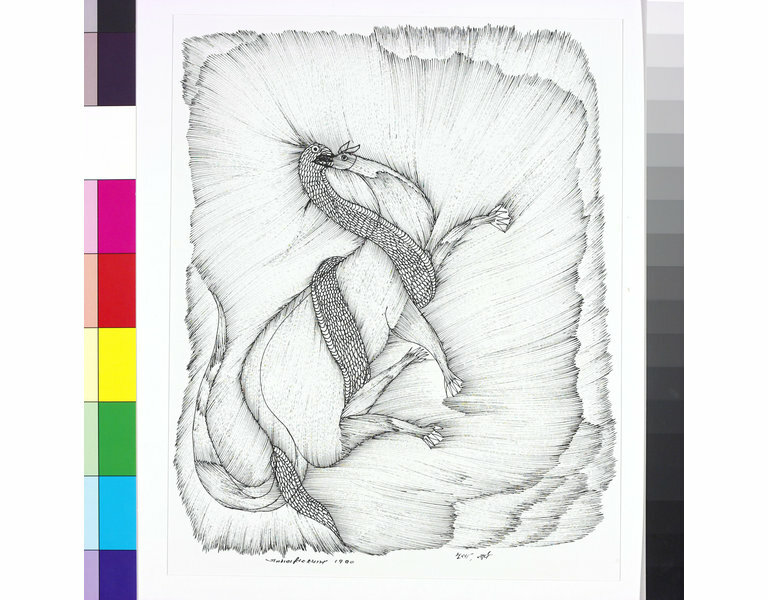 This drawing by the artist Jangah Singh Shyam is one of a set of five bird and animal images depicting the natural world of Gond tribal beliefs. Historical significance: Jangarh has been recognised as one of the most talented Indian artists of contemporary tribal art, that orginated from a rural, non urban background. In 1986 he received the 'Shikhar Samman' one of the highest artistic awards from the Indian government in recognition of his artistic contribution. This composition was produced by the artist in the latter stage of his career, possibly for an Indian gallery or exhibition at one of the folk art and craft museums in India, either at the Arts and Crafts Museum in New Delhi or the Bharat Bhavan Tribal Arts Museum, Bhopal. Jangarh died in July 2001. Jain, Jyotindra (1998) "Other Masters: Five Contemporary Folk and Tribal Artists of India": Crafts Museum, New Delhi, p16-33.